Dave Brubeck Quartet 1967. 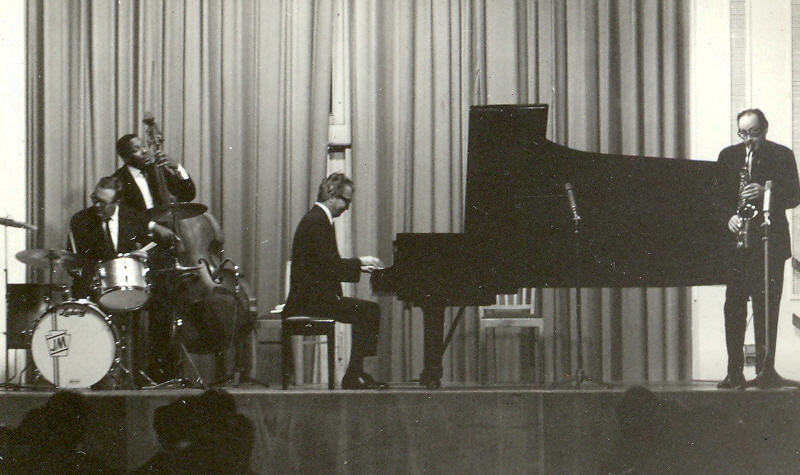 From left to right: Joe Morello, Eugene Wright, Brubeck and Paul Desmond. Jazz musician Dave Brubeck passed away Dec. 5, 2012 at the age of 91. "An Hour With Dave Brubeck" is another in Sara Fishko's series of conversations with musical figures. The interview for the program was taped in Brubeck's studio in Connecticut, this past spring. In the program, Brubeck discusses his childhood, musical influences (from jazz pianist Art Tatum to classical composer Darius Milhaud) and development. Music featured includes a very early recording of Brubeck "imitating" Tatum, Teddy Wilson and other pianists he admired; as well as some of the iconic live and studio recordings from his later days. Dave Brubeck took the stage at the Litchfield Jazz Festival in 2008 and during a conversation with John Dankosky, the host of Where We Live on WNPR, Brubeck told the remarkable story about fighting communism with jazz. Here's Dave Brubeck on going behind the Iron Curtain and what he saw--and heard. NEA Jazz Master and pianist Dave Brubeck recalls how the US State Department sent US jazz greats abroad under President Eisenhower's cultural exchange program. Blended with audio of Louis Armstrong singing a song written by Brubeck's wife, Iola. NEA Jazz Master Dave Brubeck recollects the effect of American Jazz Ambassadors abroad. During the Jazz Ambassador program of the 1950s, Brubeck and other jazz greats like Armstrong and Gillespie were sent to global hot spots, such as Iraq, Iran, Pakistan and ... Russia! NEA Jazz Master Dave Brubeck on the Power of Music and Exchange. NEA Jazz Master Dave Brubeck celebrates the importance of music (jazz) and the oneness of man. The oneness comes from, he says, "the rhythm of your heart." Unlike the vast majority of jazz musicians, Dave Brubeck was blessed with both talent and commercial success. His renowned 1950s quartet recorded standards like "Take Five," "The Duke," and "In Your Own Sweet Way." Unlike the vast majority of jazz musicians, Dave Brubeck was blessed with both talent and commercial success. His renowned 1950s quartet recorded standards like "Take Five," "The Duke," and "In Your Own Sweet Way." He was the first jazz artist to sell one million copies of an album, the second to appear on the cover of Time magazine. To this day, he sells out concert halls around the world. With his darkly lilting approach, the alto saxophonist rose to fame beside Dave Brubeck's piano. With a darkly lilting approach, alto saxophonist Paul Desmond rose to fame soloing in the crook of Dave Brubeck's piano, playing a critical part in one of the most heralded groups in jazz history. FOR MORE THAN 50 YEARS, NEA JAZZ MASTER DAVE BRUBECK HAS TRAVELED THE WORLD, FORGING RELATIONSHIPS THROUGH MUSIC. HE’S BEEN ONE OF AMERICA’S BEST REPRESENTATIVES OF CULTURAL EXCHANGE. NEA Jazz Master Dave Brubeck discussed the inspirational and innovative Jazz Ambassadors program of the 1950s. Brubeck along with other jazz legends traveled the world playing jazz and promoting peace. Irish jazz singer and radio host Melanie O'Reilly, visited the Brubeck Festival at the Brubeck Institute in Stockton, in 2007. In this program of "Jazz on the Bay", Dave Brubeck's music legacy is explored featuring interviews with the legend himself, his wife Iola and tributes from his close musical colleagues and friends including film actor/director Clint Eastwood, who also shares a little of his own involvement in jazz. Irish jazz singer and radio host Melanie O'Reilly , visited the Brubeck Festival at the Brubeck Institute in Stockton CA, in 2007. In this program of " Jazz on the Bay" , Dave Brubeck's music legacy is explored featuring interviews with the legend himself, his wife Iola and tributes from his close musical colleagues and friends including film actor/director and Chair of the Honorary Board of the Brubeck Institute, Clint Eastwood, who also shares a little of his own involvement in jazz. The tributes recorded that day now have a powerful resonance after Dave Brubeck's recent passing, and capture the inspiration he generated through his music and legacy. Jazz on the Bay , a series created by Melanie, is winner of a PPI Award (Irish National Radio Award) and is devoted to capturing the spirit of jazz in the San Francisco Bay Area, consisting of music and interviews by Bay area jazz performers, interspersed with their life stories, inspirations and personal anecdotes. Other programs in the series feature Chick Corea, Larry Coryell, Nancy Wilson, James Moody, Maria Muldaur, Frank Martin, Marion McPartland, Bobby McFerrin among others, and a special feature of Women of Jazz in the Bay Area.